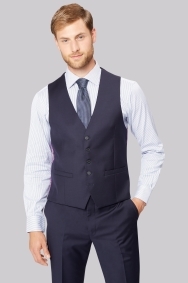 Take your workwear suit into formalwear territory with this waistcoat. Make sure you're ready for those dressed-up occasions by turning the Savoy Taylors Guild from a 2-piece into a 3-piece. All you need is the waistcoat to complete the look. It's cut in a regular fit to frame your waist without clinging tightly. You'll have room to move but still feel ultra-smart. 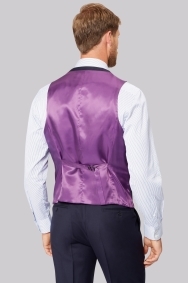 The flash of purple on the silken back makes you stand out when you take off your jacket. Keep your look pared back with a plain shirt and blue silk tie for work, then go all out with patterned paisley in a bright colour to create a talking point in the evening. Excellent product and extremely well made. Beautiful material and same notes as before. Really pleased with this waistcoat. Fits me well, colour is same as in advertising and I think it looks smart to complement my suit. No problems with delivery; arrived very quickly. Really good fit and matched the trousers and jacket perfectly. Happy with the fit.looked the part. Nice suit, first tried on in the Savoy Taylor Guild in London where customer service and help was available.